Security deposit 20% of total payment is required. Over the years, Hostel Makarska became one of the most popular places to stay for travelers of all generations in Dalmatia. 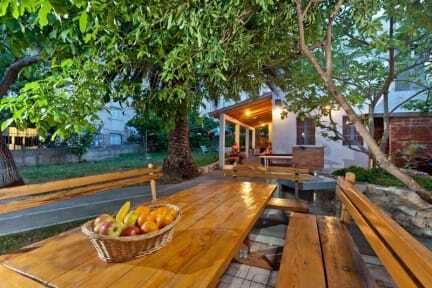 Located in the core heart of the small seaside town of Makarska, in peaceful and safe neighborhood, situated underneath the majestic mountain of Biokovo – part od famous Dinarid chains. The waterfront area and the main square is just 100 meters away and the beach is less then 5 minutes walk as well as the main bus station. This year the hostel has a new look, with it' s 48 new beds to sleep in, it's unique design and our experienced and helpful staff who are ready to satisfy even the most demanding travelers needs. We have created a charming, comfortable, eco-friendly, homely pleasant atmosphere that will make you want to stay with us even longer and it will be your home away from home. Our hostel features variety of accomodations types – 8 beds male and female dorms, 10 private rooms, 2 apartments, as well as all the usuals that you need for relaxed stay, like WI-FI, towels, linens, lockers and new fully equiped common kitchen.